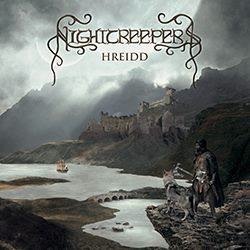 Epic folk metal band NightCreepers from Conflans-Sainte-Honorine of France is back with its latest and most ambitious work “Hreid“. NightCreepers were initially formed in 2003, but after the failure of their first effort, they were reborn more seriously in 2006. Through the early years they suffered countless line-up changes and actually only one of the founding members remains until today, their guitarist and vocalist Haarath. The band released the EPs “Helgardh” in 2007 and “Towards Abyss” in 2008, before they deliver their debut full-length album “Svingeheim” in 2009. Their second album “Alpha” was released in 2012 and finally on October 21st 2014 their third album was out, self-released by the band, like all their previous works. NightCreepers have already displayed a huge improvement in “Alpha“, compared to the debut album, so I was expecting less spectacular changes in this new album. The fact however is that the band managed to improve even more, presenting a much more complete and rich album. “Hreid” is a very melodic epic folk metal album with an almost symphonic touch in its orchestrations and a very clean and technical sound. And while there are still extreme metal elements in their music, in this new album the band has clearly paid more attention to the lyricism of its compositions. Without the need to hide or disguise their influences, NightCreepers offer us 47+ minutes of finest epic majestic folk metal. There are totally 14 songs in “Hreid“, including 6 short instrumental intros / interludes and a new version of the track “Alpha” from the previous album. It is a very epic atmospheric work with really rich orchestrations and a cinematic approach, as well as some progressive metal elements in its music. Guitars, synths and traditional acoustic instruments are in perfect balance with each other. The rhythm and mood of their songs are ever-changing in harmonic transitions inside the compositions, moving from acoustic epic folk songs to epic black death metal outbursts and everything in between. Their music is quite complex and technical and all songs are of a high composition and arrangement level; the coming of Chiron (live orchestra samples) in their line-up has clearly opened new possibilities for the band. Haarath’s vocals is the most “extreme” element of their music, since he mostly sings with black death metal screams, accompanied of course by epic choirs and clean male vocals. All their lyrics are written in English dealing with epic themes and legends based on the general concept of choosing the path which fits both your destination and the actual person you are. “Hreid” was my first contact with NightCreepers and it was a very positive one. I recommend this album to fans of epic folk majestic metal, who would most probably also enjoy their previous works. I like the melodic turn of their music and the enrichment of their orchestrations and I am expecting even greater things from them in the future, especially if they work a little more on getting a more personal sound. “Hreid” is self-released in a standard jewel-case CD edition with 8-page booklet, including all the lyrics. The wonderful artwork is by Raphaelle Monvoisin. You can watch 2 album teasers below and if you like what you listen, you can visit their official pages for more details and if interested to get the album(s) directly from them.